When I read the scene in the first chapter of The Short and Tragic Life of Robert Peace where three-year-old Rob sings himself to sleep with Grandmaster Flash and the Furious Five lyrics, I remembered the summer of 1982 when I listened over and over in my bedroom to a recording of “The Message,” taped on a cassette from the WARR radio show hosted by Freddie “The Preacherman” Hargrove. I kept hearing “The Message” as I continued to read Jeff Hobbs’ biography of Robert Peace and began thinking of the song as the first cut on Rob’s soundtrack. When I started to plan the paper that would serve as a model for my students’ own analyses of Hobbs’ book, I knew that “The Message” would be my subject–one that would enable me to heed the advice that I ask my students to follow: to see their interests “through academic eyes” (Laff qtd. in Graff 250) and one that would give me an opportunity to meditate more on “The Message” as a prelude to Rob’s story. In Chapter One of The Short and Tragic Life of Robert Peace, Jeff Hobbs recounts Rob’s mother, Jackie, wincing on those nights when she put her toddler son “to bed with a book and heard him instead singing himself to sleep with Grandmaster Flash and the Fabulous [sic] Five lyrics” (16). Readers of that sentence may wince as well, not because they share Jackie’s sentiments about rap music, but because they recognize the error (of “Fabulous” for “Furious”) that eluded the book’s author and editor. Yet despite that mistake—one that risks marring the memory that Hobbs narrates—his account of young Rob singing Melle Mel’s words still resonates as a prelude to his biography. “The Message” isn’t Rob’s story, but as the implicit first cut on his soundtrack, Grandmaster Flash and Furious Five’s groundbreaking rap introduces Rob’s fascination with music, and its references to illegal drugs, mental breakdowns, and untimely death echo the events of his life. When Jackie hears Rob singing himself to sleep with the words of Grandmaster Flash and the Furious Five, she thinks not of her three-year-old son’s uncanny ability to learn lyrics but rather of the world that “The Message” depicts. The line “Broken glass everywhere” (Fletcher et al. 5) evokes images of the “bits of glass from crack pipes and vials [that] were embedded in the dirt beneath the swing set” in the park where Rob played (18). The pervasiveness of illegal drugs in the neighborhood, evidenced by the fragments of pipes and vials, prompts Jackie to do whatever she can to ensure that Rob will get away from East Orange. In Chapter Three, as Jackie looks up at her old high school, she realizes that “with a few more years of determination and sacrifice on her part, Rob would leave. He would do so in spectacular fashion” (69). Though Rob leaves East Orange in spectacular fashion, he and the handful of other Yale students from the inner city find their new surroundings in New Haven less-than-spectacular, so much less that they’re often pushed “close to the edge” (Fletcher et al. 13, 27 . . .) by the rarefied world of the Ivy League but are reluctant to seek help. One of Rob’s classmates, Raquel Diaz, who grew up in poverty in Miami, “believed that ‘going crazy’ was a luxury of the wealthy, because poor people like her had too many responsibilities to deal with mental health episodes” (178). Rather than seeking help, Raquel opts to take her junior year off to work as an au pair in Italy and to visit China. As Rob helps her lug her furniture to the dorm’s basement for storage, he tells her “not to worry about anything at all except getting yourself right” (178). Rob doesn’t visibly crack the way the unnamed man from St. Benedict’s Class of ’74 does, or his Yale classmates Raquel and Oswaldo do, but his ability to maintain his composure ultimately proves more of a liability than the detours that Raquel and Oswaldo take to get themselves right again. Unlike the man in “The Message,” Rob doesn’t hang himself in a cell, but he remains a prisoner of his drug-dealing—the selling more of a “Neon King Kong standin’ on [his] back” (Fletcher et al. 41) than the use, itself. Elsewhere in Rob’s biography, references to music reveal his developing intellect and his evolving tastes. In Chapter Three, Hobbs writes of Rob “devot[ing] much of his time to memorizing rap lyrics of groups like A Tribe Called Quest: breaking them down, analyzing them, internalizing the words as poetry” (71). Chapter Four depicts Rob as the “boy in the class who knew the lyrics of every single Bones Thugs-N-Harmony song, every single word to every single song. Because these songs were typically so fast-paced [. . .] learning one song, let alone all of them, was a feat that inspired awe” (79-80). And in Chapter Eight, chronicling Rob and Jeff’s senior year at Yale, Hobbs observes how his roommate’s “musical tastes seemed to have softened over time, and in the room I’d been hearing fewer freestyle-based, full-throttle gangster rappers like Ludacris and more melodic, over-produced songs like the one we were hearing now, [Nelly’s] “Ride Wit Me.” (190). While those songs compose Rob’s soundtrack as well, the opening cut by Grandmaster Flash and Furious Five—unfortunately misnamed by the author—echoes throughout the book, it’s refrain underscoring Rob’s drug-dealing, how “close to the edge” (Fletcher et al. 13, 27 . . .) he and so many of his peers came, and how, though his musical taste “softened over time,” his risk-taking continued “full throttle” (190) in a life in which he “lived so fast and died so young” (Fletcher et al. 106). Fletcher, E. and M. Glover, S. Robinson, and J. Chase. 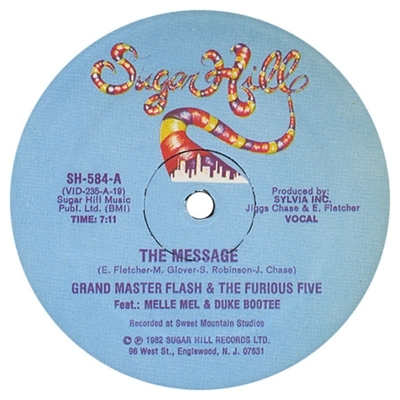 “The Message.” Grandmaster Flash and the Furious Five. The Message. Sugar Hill, 1982. LP. Graff, Gerald. “Hidden Intellectualism.” “They Say/I Say”: The Moves That Matter in Academic Writing. Eds. Gerald Graff and Cathy Birkenstein. 3rd ed. New York: Norton, 2014. 244-51. Print. Hobbs, Jeff. The Short and Tragic Life of Robert Peace. New York: Scribner, 2014. Print.